As December arrives so does a wonderful program of classical a cappella choral music presented by The Island Consort chamber choir. 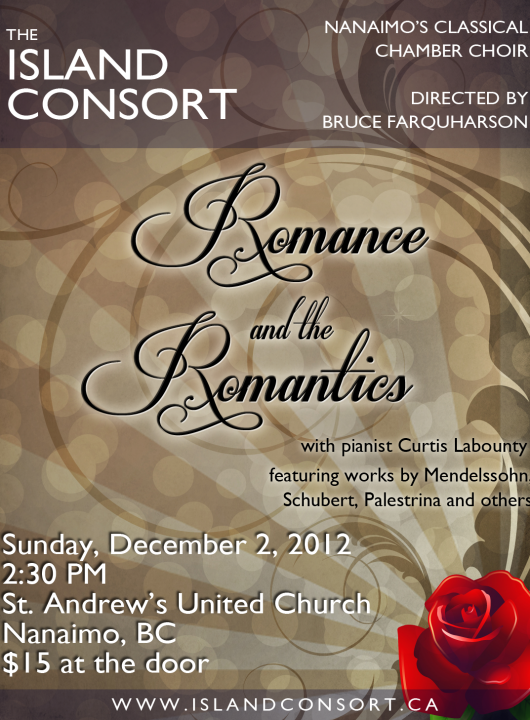 Directed by Bruce Farquharson, the choir will perform repertoire that is quintessentially “romantic” in the broadest sense of the word, with 5 selections accompanied by pianist, Curtis Labounty. The program begins with three Early Music works; a pellucid “Ave Maria” by Jean Mouton from circa 1500, Monteverdi’s “Ecco Mormorar l’Onde” – a love poem, and Palestrina’s Missa Brevis, “Aeterna Christi Munera”. Music of the Romantic Period is featured with Mendelssohn’s “Hear My Prayer” (soloist, Skye Donald), Bizet’s “Agnus Dei”, and a set of 3 Schubert songs; “Schicksalslenker”, “Der Tanz” and “Standchen” (male choir plus soloist, Sharon Sinclair). This leads to “Going Home”, based on Dvorak’s 9th Symphony, Eleanor Daly’s “Ubi Caritas” for women’s choir, Lindberg’s “Shall I Compare Thee”, and a song in Russian, “Nesnakomka” – the mystery woman. The program finishes with two songs that lead to the Christmas season; Sandstrom’s lush arrangement of “Lo, How a Rose”, and Pearsall’s setting of “In Dulci Jubilo”.